EYP Architectural intern Sean Wheeler, left, greeted Tech Valley High juniors Ryan Klein of Germantown, Robbie Scott of Coxsackie Athens, Ben Boyer of Catskill and Kiam Kaiser of Berlin for their first day. Tech Valley High School’s annual career exploration program called I-term started on Monday. I-Term gives students the opportunity to explore their interests and gain experiential learning in careers. More than 50 businesses, organizations and professionals are involved in this year’s program. 36 internships including: NYS Assembly & Senate, Greane Tree Technology Group/Albany Can Code, American Cancer Society, Albany Institute of History and Art, EYP Architecture & Engineering. 8 field trips including: Albany County District Attorney’s Office, Ecovative, Regeneron. 10 workshops featuring: IBM, Albany Police Department, NY Biz Labs and Transfinder. I-term is undertaken by all TVHS students. It’s a hands-on opportunity designed to foster direct workplace interaction between students and professionals to give students a realistic understanding of an industry or field of study. It starts freshman year and scaffolds to build in complexity over four years. “It exposes them to a lot of careers to help them make better-informed decisions for their future,” Principal James Niedermeier said. Every February, regular coursework pauses and students work closely with a mentor to create unique, rigorous and applied learning experiences. Freshmen and sophomores attend workshops and talk to visiting speakers from different careers. These workshops are called Exposiums, and are designed to expose students to interesting things happening in local businesses. The goal is to inspire students to become educated about potential careers in the Tech Valley Region. Presenters talk about their companies, why they are located in Tech Valley, what their jobs are, why they love their jobs, potential career opportunities and desirable employee attributes. Some of this year’s speakers include Assemblyman John McDonald, owner of Marra’s Pharmacy, Emi Kondo Olsson of IBM, Brendan Cox of the Albany Police Department, YNN Meteorologist Heather Morrison, Annmarie Lanesey of Greane Tree Technologies and TVHS alum Cody Bellair of Precision Valve & Automation. They also attend two field trips. Sites this year include NY Biz Labs, Regeneron, Plug Power, NYS Empire Plaza & Museum, Ecovative, YNN & the Albany County District Attorney’s Office. Freshman additionally create a poster based on an interview with a professional who works in a career that interests them, and do additional research on a particular field. Sophomores do the same, but instead of creating a poster, they must give a presentation called a PechaKucha, a format in which the presenter shows 20 images each for 20 seconds. The images advance automatically and the presenter talks along to the images. For upperclassmen, the level of career exposure advances. 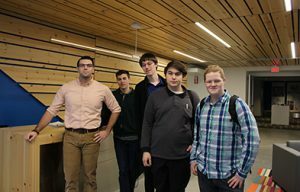 Juniors spend a week interacting with professionals at a variety of locations, including Albany Medical Center, EYP, WMHT, 1st Playable Productions and Unity House. They could also choose to make their own contacts and organize an internship themselves. Some of the sites students chose include the Johnson Space Center in Texas and Woods Hole Oceanographic Institution in Cape Cod. The juniors will give TED talks about their experiences. Seniors have the highest level of career exposure. They chose their own internship sites and work alongside professionals for two weeks. From that experience, they have to create an artifact to represent their work. Seniors are now creating portfolios that must include a research paper, a work log and a written reflection of their experience. Seniors will present their work in March to a panel of their peers, faculty and business professionals. In addition to career exposure, I-term also allows students to explore their passions. They participate in Paedeia (pronounced “pie-day-ah”), in which faculty, staff, parents and community members teach fun, project-based mini courses or workshops around a topic or skill. Topics this year include Aikido, music and podcast recording, craft sewing, herpetology: keeping reptiles & amphibians, comic book collecting, medieval armor, weapons & combat, origami and chess.